If you are looking for a reliable software development company to enhance your business performance, that differentiates you from your competitors and helps you become more cost efficient, you have come to the right place. 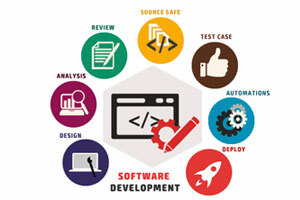 We understand that every business has special software requirements that off-the-shelf software solutions cannot solve. Our customer-centred approach enables our developers to capture your business requirements and develop a fully customised software solution that solves your unique business needs. Our software developers possess over 40 years of experience in developing custom software solutions for small and large businesses. We have helped companies tremendously to reduce business overhead costs and streamline their business workflow. We thrive in building good relationships with our clients by helping them to meet their IT requirements. Basically you tell us about the type of solution you need, what part of your business processing you want it for, how you want the software solution to work in conjunction with your existing IT infrastructure, and we will design and develop the solution to meet your exact needs. From the development phase to testing and deployment phase we work with you all the way and ensure that we meet all your business requirements. Our solutions are scalable, to accommodate future expansion or additional requirement. Our solutions are also modular and flexible enough to modify and upgrade as your business grows . Therefore the software solution we develop for you will grow with you as your business evolves and transforms.